Equi-tee makes accessories for several styles of fencing styles to make them safer for your horse. 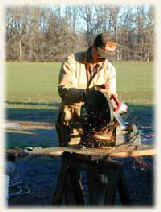 Installing our products reduces horse injuries and excessive maintenance. 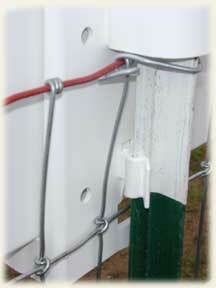 Electric fence quick studs for vinyl posts or hot wire clamps for pipe fencing are some of the products we build. We also make a special T-post adapter which allows you to install a a beautiful horse fence like for around $4.50 a lineal foot! The heart of the Equi-Tee system is our Equi-Tee adapter which allows the vinyl rail to be firmly mounted to the metal T-posts. 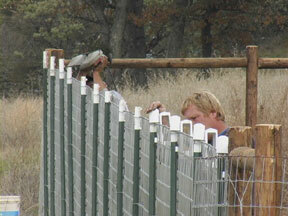 Building a complete fence requires T-posts, fence wire and vinyl top rails. We estimate the cost per foot by using the following figures: $1.20 per lineal foot for virgin PVC rails, $1.20/lf for 2X4 non-climb wire and $3.80 per each 6' T-post (.47/lf). We only sell the adapter, the rest of the materials must be purchase separately. By taking advantage of the visibility of vinyl and security of non-climb you will be safely enclosing horses with fencing designed especially for them while spending about half the cost of any other style of horse fence. Our adapter is the worlds safest T-post cover, allowing you to mount a vinyl sight line to T-posts, adding visibility and strength while protecting your horse from lethal T-post impalement! Equi-Tee beautifully frames your property, and keeps your horses safe and secure. Your fencing installation is a reflection of the pride you have in your property. Surround yourself with a secure and attractive fence that looks like a million. You'll find that since woven wire is one of the easiest fence styles to put up, you can confidently say "I installed it myself". This eye catching appearance is made possible by the Equi-Tee adapter. 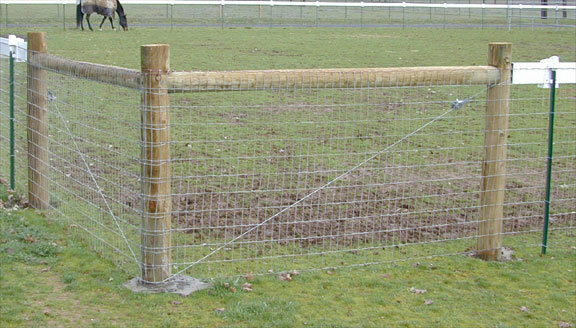 A permanent fence demands strong anchor posts and H-bracing to keep the wire tensioned. Careful post spacing and accurate post lengths and heights are required to mount the top rail. 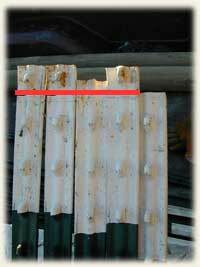 You may need to cut the tops of the posts to assure that the rail will follow the wire evenly. Once you've put up the first hundred feet you'll be hooked on its simplicity, and thrilled at the sight of your installation. If this is your first fence installation we can suggest an excellent book titled Fences for Pasture and Garden, written by Gail Damerow, available through Storey Books . It will give you some guidance on evaluating which materials and tools are required. How is the Adapter attached? How the top is held to the post? In this photo we can see how the Post Cover, the Post Clip, and the Clip-Top all work together to securely fasten the adapter to the T Post. 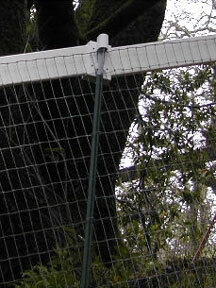 If 2"X4" non-climb is used the Post Clip is usually positioned between the squares of the fence. Occasionally the wire knots must be clipped to allow the horizontal wires to be repositioned so there is more room. How do I get the vinyl even on the posts? A visually pleasing vinyl sight line is actually pretty simple to achieve. The easiest way to do this is to install each tee post so that there is at least 1 1/4 inch of post ABOVE the top horizontal wire of the fence. If you are using Red Brand fencing, this is the red top wire. If the post is more than 2-1/2 inches above the wire, it must be cut off off or the cap will ride up above the wire and this will cause the vinyl to look uneven. We use a metal cutting bandsaw, but a Sawsall or cutoff wheel can also be used. When you are installing the wire, if all the horizontal wires follow the lay of the land and the fence looks visually nice, then by cutting the t posts evenly above the wire will make the sight line look good as well! What do I do on hills and slopes? 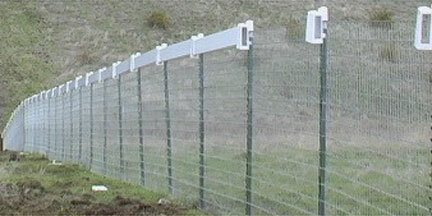 If you can install field fence on a slope, you can install our adapter and a vinyl sight line. A slope of up to six degrees can be installed without any modification of the adapter. The rails may need to be cut to an 8 foot length at each t post so that they can follow the slope. If the slope is extreme, (up to 25 degrees), and the posts are perpendicular to the horizon (like in the photo), then the adapters must then be notched so there is enough room for the rail to be at an angle, and there will be a step at each post.. Because the wire is at an angle to the post, the t-post will need to be much longer to allow for the bias of the wire. If your t-posts will be perpendicular to the slope and the wire, then the adapters will be installed normally and the rails will feed straight through. What do I do at corner posts? 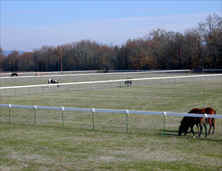 Usually there are anchor posts (H-braces) at each of the corners to hold the field fence in tension. Install an extra T-post and adapter next to the wooden anchor post and slide the top rail through the adapter until it touches the post. How do keep the wire tight? Use a ratchet to stretch the diagonal tension wire. We have found that the smooth wire ratchets work exceptionally well in holding the two posts of the H brace together. Additionally there is no loop of wire to catch your horses hoof. How do I attach the wire to the post? When you need to attach the wire to the post, un-strand the vertical wires by cutting the knots away from the horizontal wires. Starting at the center of the mesh, wrap the wire around the post and then tie the wire back to itself by winding it round Starting at the center of the mesh insures that by the time you reach the outer (last) wires, the strain of the stretching is taken up by the wires you have previously wrapped. That way you can safely cut the wires that you are pulling against without the fence loosening. Alternate method to trim the T posts to length. In some cases it is preferable to trim all the -posts to length before installing them. This is useful on ground that is totally flat, and where all the t-posts will be installed to the same depth. To establish the trim length, first determine where the lower clip will mount. 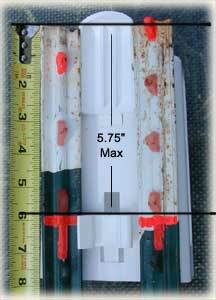 In this cutaway photo you can see how the top of the post nests fully into the post cap. The post clip is also in the lower portion of its slot. Usually this measurement is between 5-1/2" and 5-3/4 inches from the top of the t-post. This configuration will prevent the top PVC rail from popping off the top of the T-post. We measure from the clip and to the top of the post and this measurement must be the same from post to post. In this photo you can see that different post brands have various spacing between their nubs (painted orange). The number and spacing of the nubs is not important. However, it is necessary to make sure that all of the posts are trimmed the same length equally 5.1/2" above where the post clip mounts. The dimension from the top of the post top of the clip cannot exceed 5-3/4 inches! To find where to trim YOUR posts, snap the clip 4 to 5 spaces from the top of the post. Measure up 5 1/2 inches. The is the ideal height above the little nub sticking out of the t post. 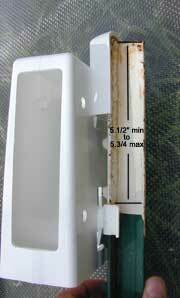 Trim all the posts to this same measurement above the nub and the adapter will fit perfectly. If you are considering a large installation, please request a sample from us and give us a call to discuss any questions you might have about trimming the tops of the posts.